Switching database vendors is often considered an exhausting challenge for database administrators and developers. Complexity, total cost, and the risk of downtime are often the reasons that restrain IT decision makers from starting the migration project. The primary goal of this book is to show that, with the proper planning and guidance, converting from MySQL to IBM® DB2® is not only feasible but straightforward. If you picked up this book, you are most likely considering converting to DB2 and are probably aware of several of the advantages of to converting to DB2 data server. In this IBM Redbooks® publication, we discuss in detail how you can take advantage of this industry leading database server. 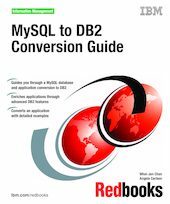 This book is an informative guide that describes how to convert the database system from MySQL™ 5.1 to DB2® V9.7 on Linux® and the steps that are involved in enabling the applications to use DB2 instead of MySQL. This guide also presents the best practices in conversion strategy and planning, conversion tools, porting steps, and practical conversion examples. It is intended for technical staff that is involved in a MySQL to DB2 conversion project.